Years ago I saw a wonderful book that had been cut around illustrations in the book and layered together to form a piece of art. 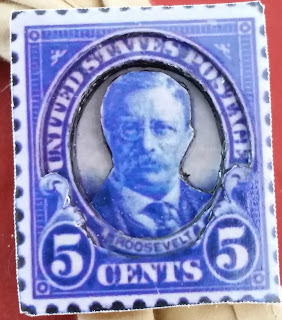 I though to myself recently that this same process would make some great slides so I went looking for pictures of Scouting stamps. I enlarged the pictures to the size I wanted the finished slide to be and made several copies of the image. Using an old 1993 Almanac we were throwing away, I pulled out several pages to about a 1/8 inch thickness. I coated the edges these pages with some Mod Podge and left it overnight to dry. The next day I cut out the images of stamps and glued them to the pages. Using a band saw I carefully cut out the images and pages into their shapes. Once again using Mod Podge, I sealed the outside edges let it dry over night. Now here is the interesting part. With an x-acto knife, I cut away the background of the stamp leaving just the frame and the principle parts. The first stamp above, for example, I cut away everything but the frame, the Explorer Scout (saluting), the Boy Scout, and the Cub Scout. I did this through all the layers of the paper pages. Once done I coated the inside of the areas I cut with Mod Podge and let it dry over night. Taking another block of the same image, I repeated the process but this time I only left the frame, Boy Scout and the Cub Scout. Mod Podge to the inside cut surfaces and set this one aside to dry. The third block left only the frame, the Cub Scout and Mod Podge treatment. The forth block had everything cut away but the frame and more Mod Podge. I also took this opportunity to Mod Podge around the part I removed to give me a solid piece to cut out the Scout symbol. I cut half the Scout symbol out and then Mod Podged. When dry I cut the other side of the symbol and applied Mod Podge to this side. The next day, I painted the inside edges of each with some black paint. When the the paint was dry, I started with the another block that had nothing cut from it and glued the first block to it using the Scouts and frame as my guide to alignment. 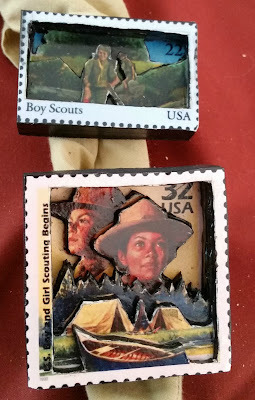 For the third layer, I glued the second block, the one with only the Boy Scout and the Cub Scout, to the first and bottom block. The forth layer was the Cub Scout block and the final layer was the frame block. When the glue dried I trued up the sides and the painted the sides. To finish the slide I glued a loop to the back and gave the slide a couple of coats of poly. I enjoyed making the US Boy Scouts Stamps and even the stamp of the first and only Chief Citizen Scout. Some might notice I have not include the 2010 Scouting stamp. 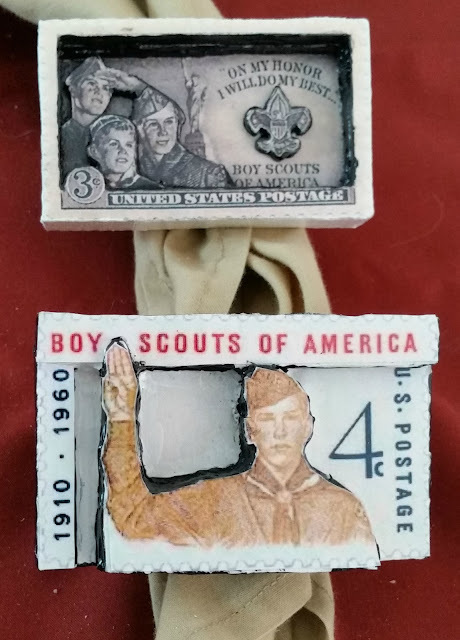 I don't consider the stamp to be a representation of the Boy Scouts of America.